Why Tesla Motors, Inc. Investors Should Ignore This "Catalyst"
Investors will be better off ignoring this shortsighted report about Tesla stock. Banking and financial services group UBS recently spoke up about Tesla (NASDAQ:TSLA) stock, saying it is likely to outperform thanks to a possible gigafactory announcement that could serve as a catalyst. While it's possible Tesla stock's 2% jump on Friday could have something to do with this report, it shouldn't; speculation on the direction of near-term volatility for a stock like Tesla is an impossible game to play. UBS (via 24/7 Wall Street) has listed Tesla as one of six companies it believes has catalysts that will drive "near-term stock outperformance." The electric car maker has historically been very volatile around earnings time, and it is currently scheduled to report on July 3. The UBS team also mentioned the possibility of a gigafactory announcement, which could boost the stock as well. The problem with a statement like this was voiced by -- of all people -- a UBS analyst earlier this year. UBS analyst Colin Langan acknowledged Tesla's "disruptive model" in March, but warned that all the rosy potential may already be priced in. The problem with a near-term projection for Tesla stock, therefore, is that the stock's value today is already based on forward-looking assumptions, execution on Tesla's gigafactory being one of them. Sure, it could be argued that perfect timing and execution of Tesla's gigafactgory, or the world's largest lithium-ion factory, isn't entirely priced in. But there are two underlying problems with near-term predictions for Tesla's stock price. First, while a gigafactory announcement -- perhaps about where Tesla has broken ground on the project -- may get Tesla one step closer to execution, it just would be one small step of many more to come in the long journey for Tesla in its efforts to become a mass-market player. In other words, there would still be enormous risk to the project, even after the announcement. Rendering of Tesla's planned Gigafactory. Image source: Tesla Motors. Second, there are too many other factors that could influence stock price in the near term. Other announcements, whether they are positive or negative, could have large effects on the near-term stock price. With the stock's value today so dependent on the future, announcements related to Tesla's plans are likely to have a leveraged effect on the stock price today. And while a gigafactory announcement may be likely, there are too many other factors that could come into play to make near-term predictions for the stock price useful. But UBS could be wrong, too. As a Tesla shareholder myself, I'd certainly be happy to see the stock perform well. But it's going to have to be more than one simple announcement that's going to drive Tesla's underlying business. Further, investors with Tesla on their watchlists should acknowledge the likely volatility to come. 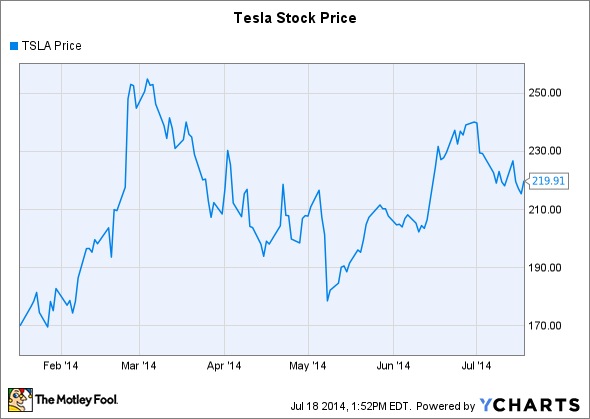 For fast-growing companies like Tesla, volatility is inevitable. Model S outside of Tesla's headquarters. Image source: Tesla Motors. The much more difficult thing is to say, 'Well, how will the stock market value us in the short to medium term?' That is an impossible thing to say because the stock market is kind of manic-depressive. I mean, particularly with respect to Tesla, you know. But, I mean, the reason Tesla is so volatile is because so much of Tesla's value is a function of market confidence in our future execution. So, if something happens that diminishes or increases that, it has a highly leveraged effect on our current stock price. ... So I'd say, Tesla is a very good investment for the long term, but it's impossible to say what it is in the short term. Apparently, UBS has more insight into Tesla's stock price than Elon Musk. Do yourself a favor and: (a) Don't sweat short-term price swings, because they are often irrational (and frequent for growth stocks), and (b) don't try to guess where Tesla's stock will go in the near term, because Mr. Market is known for his surprises.